Stockport Council has signed up to a TUC (Trade Union Congress) charter aimed at helping employees who become terminally ill and work. 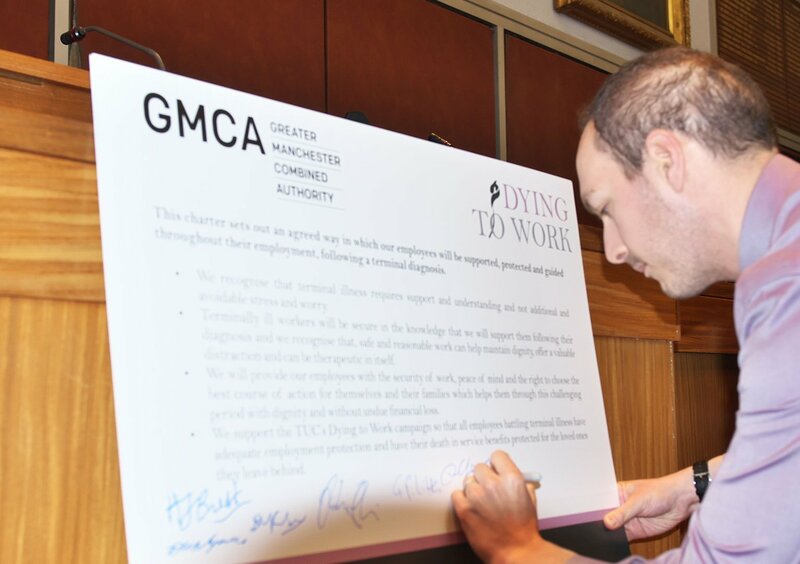 The Dying to Work Voluntary Charter is a TUC initiative which sets out how employers can support terminally ill workers following their diagnosis. It is part of the TUC’s wider Dying to Work campaign which is seeking greater security for terminally ill workers through a ‘protected period’ where they cannot be dismissed as a result of their condition. “Signing up to this charter makes it absolutely clear to Council employees that we are committed to providing them with support and understanding throughout any diagnosis of terminal illness. Any employee facing such a traumatic event can be confident that they will be treated with the utmost respect and dignity. Stockport Council along with the Greater Manchester Combined Authority (GMCA) and the city region’s other nine local councils are the latest employers to sign up to the charter.